Out from the Shadows...they're talking about us! A group of Petaluma radio enthusiasts is slowly closing in on a longstanding dream of reviving a locally-based FM station and is seeking to assemble a group of creative minds to help populate the airwaves. 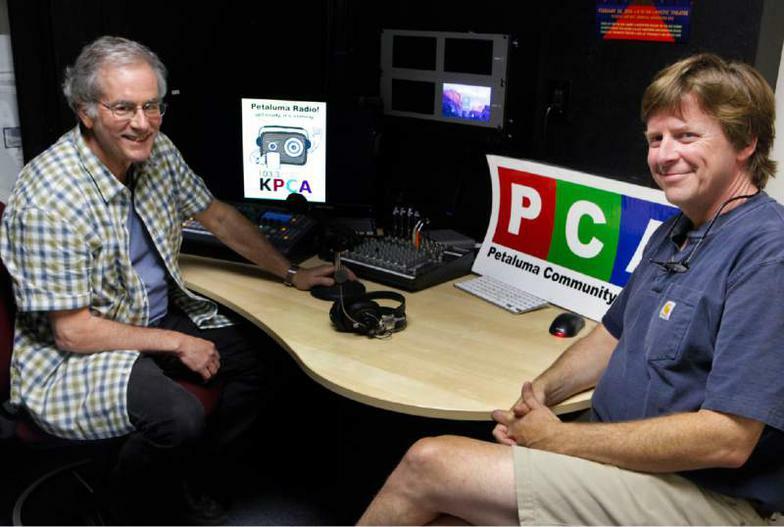 As Petaluma Community Access, a local media nonprofit, is ironing out the details about how and when KPCA low-power FM radio 103.3 will be accessible through residents’ radio dials, it’s looking to the public to shape the future station’s programming. The group held its first meeting on July 21, and has set a second stakeholder meeting at 6 p.m. Aug. 25 at the 205 Keller St. studio. Fisher said about a dozen interested parties have already thrown out ideas — ranging from radio dramas to a historical show to music-based programming — and he said the studio’s four part-time employees are ready to jump in and help potential producers and personalities develop their concepts into a radio reality. 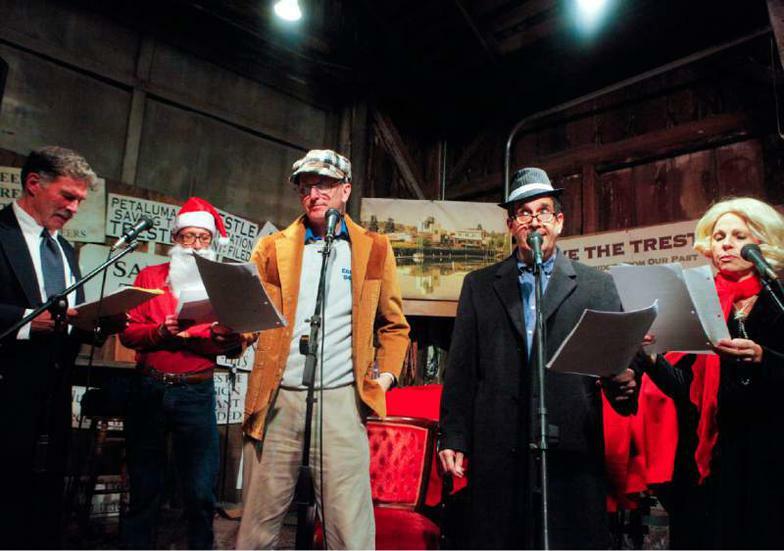 Among those eagerly awaiting the area’s first radio station since KTOB, Petaluma’s most well-known station, was sold in the 1990s, is the Petaluma Radio Players, an acting troupe that creates radio dramas. The group is already busy producing original content for the airwaves, including a series of historical fiction murder mysteries and a drama that delves in to the complexity of human interaction and memory, according to supervising producer Ralph Scott. Fisher said it’s not yet clear what exactly the finalized programming will look like, but he’s confident it will reflect the diversity of Petaluma’s population. While the road map for programming is drafted, Petaluma Community Access staff is still waiting to clear several hurdles before the station launches into the airwaves, including identifying one of several potential locations to place an antenna or a transmitter, and converting an office in the studio into a radio-ready sound booth. 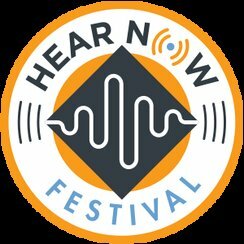 Staff plans to visit other low-powered FM access stations across the Bay Area while compiling a shopping list for its own needs, according to Executive Director John Bertucci. Though loose ends remain, staff was quick to point out that laying the groundwork for programing and planning for the future is an important step at this juncture. Bertucci said he hopes the station will be launched in September, but if that goal falls short, online outlets including the website as well as one of the three public access TV channels can be utilized for broadcasting radio content. The clock is ticking, however as an extension to the initial FCC license requires the station begin broadcasting by late 2017, according to Fisher. Though exact figures needed for launch and for the station’s annual budget have yet to be pinned down, Bertucci said the organization could be as much as $20,000 away from its initial financing goal. The nonprofit will continue its annual Oscars-themed fundraiser and is eying ways to set up an online donation system and looking for sponsors, he said. When it’s operational, KPCA will share the airwaves with stations in Napa and Sonoma, and is slated to broadcast during limited hours between Sunday afternoon and Friday morning, Fisher said. Looking to the future, Bertucci said he hopes to find a way to host around-the-clock programming. Petaluma Mayor David Glass, a former professional sportscaster who still gets in front of the camera for monthly programs including a community update with Aqus Café owner John Crowley, said that station will be an asset for Petaluma. He noted that among other things, the airwaves could be a place to feature local sports programming, while also serving as a training ground for those with aspirations for a broadcasting career. “To have a local radio station that’s not tied into a commercial endeavor — a local program available to do something you want to do — what a great opportunity,” he said, adding that he doesn’t have plans for his own show, but he’ll offer his help if necessary. Bertucci said the station provides an easily-assessable microphone for the community to be heard, and he encouraged Petalumans to participate in the conversation. 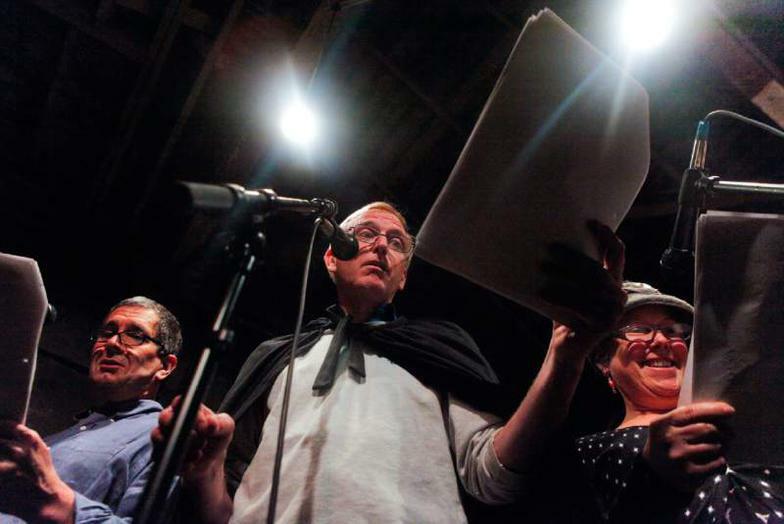 In other words, Petaluma Radio Players is an ensemble of actors, writers and theater artists devoted to the nearly forgotten craft of classic live radio. 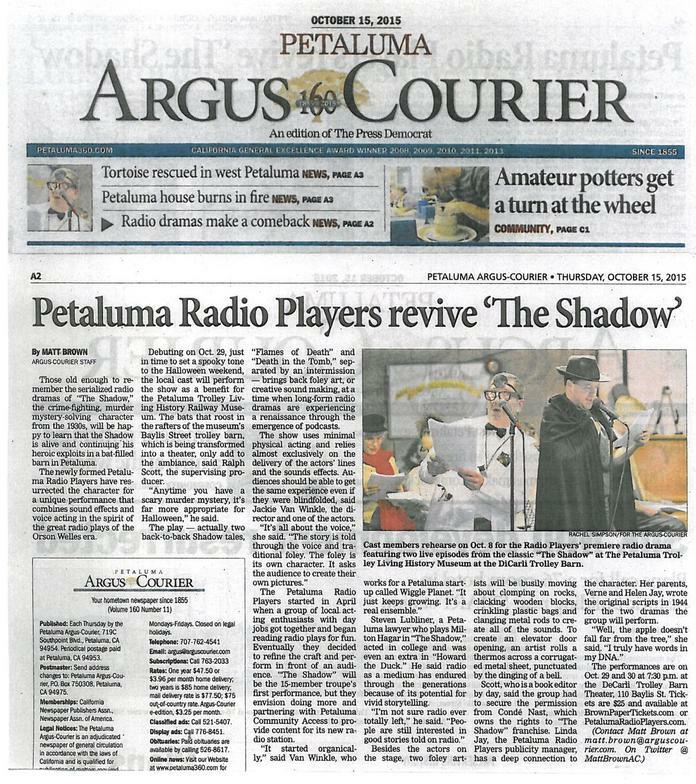 Last year, as its inaugural presentation, the group presented, on two consecutive nights, a live staging of authentic episodes from the 1930’s radio mystery “The Shadow.” As text, the performers used actual scripts provided by Petaluma’s Linda Jay, whose parents wrote the episode as radio writers in the 1940s. 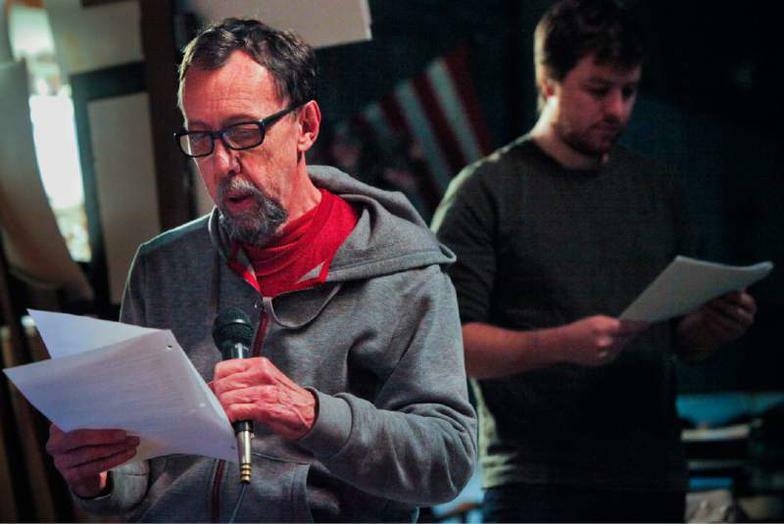 Employing a troupe of actors — some experienced, many learning the ropes as they went — the scripts were read aloud, the performances enhanced by “Foley artists” creating the sound effects using a variety of machines and household items. The script called for the sound of a “midget respirator,” and with no idea how to fabricate something like that, the actors decided to just fake it and make the sound with their mouths. Those first twin performances were held at the DiCarli Trolley Barn and played to sold-out houses. 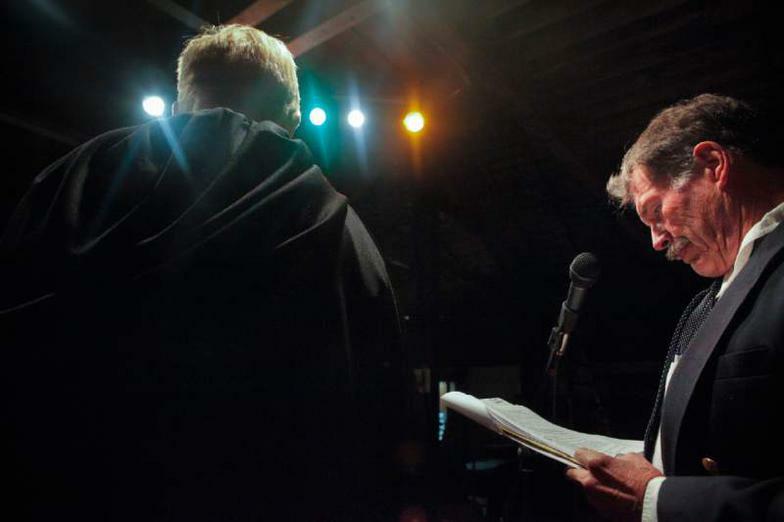 Since then, the group has kept at it, finding short works to perform as radio theater, recording their efforts and stocking up a catalog of pieces that will, if all goes according to plan, be aired when Petaluma’s long planned KPCA-FM radio station hits the airwaves early next year. 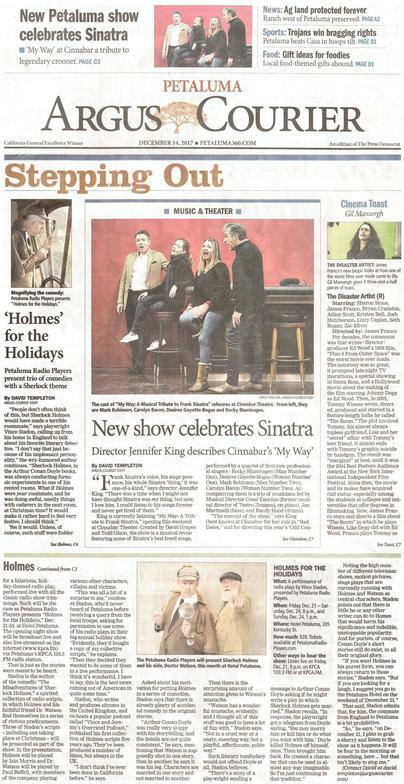 This year, continuing in the same mysterious vein as the Shadow shows, Petaluma Radio Players will be back on stage again with four short pieces involving murder, mystery, and crime — at least one of which has a decidedly Christmas theme. “We’re calling the show “Slay Bells Ring (Are You Listening?) and we’re not just excited because it’s going to be a great show featuring three pretty new pieces and one classic, but because we’re going to be in a pretty classic venue to do it,” Scott said. The performance will be held in the newly refurbished ballroom of The Petaluma Hotel. “It’s a beautiful place, with lots of history,” Scott said. All four plays will be recorded live and will be broadcast sometime in the future on the KPCA. 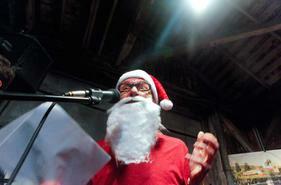 Kicking the show off is “The Noir Before Christmas,” a new piece by Petaluma author Steven Lubliner (“Threeway”). It blends the beloved holiday poem by Clement Moore with elements borrowed from 1930’s gangster movies, and is narrated by a tommy-gun toting mob boss. “Trifles” is a twisty, surprise-packed, highly influential 1916 play by iconoclast American playwright and novelist Susan Glaspell, whose full-length play “Alison’s House” won a Pulitzer Prize in 1931. “Trifles,” a drama about a Nebraska housewife who becomes a suspect when her husband is found dead, has been cited by historians and theater critics as amongst the most significant theater pieces ever written. The rest of the program includes “The Railroad Detectives,” from first-time playwright Kate Crockett. It’s a noirish yarn about a bank owner and his socialite wife, who suspect they are sharing a train ride with the very man who just robbed their bank. And finally, “Playing with Knives,” from Mendocino playwright and children’s book author Natasha Yim (“Goldy Luck and the Three Pandas”), is a short mystery-comedy about a couple who are accosted in a dark alley, and prove that their relentless chatter and non-stop talk is a mighty a defense as any martial art.